105 Foot Nordlund Flybridge | Christian & Co. The vessel was inspected while hauled. Hull construction material is molded composite fiberglass. Deck is constructed of molded fiberglass and above deck structures are constructed of molded fiberglass. Coring is unknown. Bulkheads’ construction is unknown. Overall condition of the hull structure appears good. The vessel’s weight is unknown. Exterior rails and hardware appear satisfactory. Cosmetic condition of vessel appears satisfactory – good externally and internally. Vessel’s external colors are white with a full green boot stripe and red and green boot stripes forward. Below waterline through hull fittings appear satisfactory. The vessel is equipped with nine electric / automatic bilge pumps that appear good and the bilge is holding minimal water and is clean. The ventilation system consists of two engine room blowers and natural ventilation that appears good. General housekeeping appears good (boat is in the yard). Engine external surfaces appear good and exhibit no significant rust, oil or coolant leaks. Engine hour meters exhibit 1,027 and 234 hours. The captain states that the actual engine hour meters are slightly less than 15,000 and can be definitively determined by a technician with a reader. Motor mounts appear good. Cooling systems appear good. Fuel systems and components appear good. Exhaust systems and components appear good. Electrical systems and components appear good. Engine control systems appear good and shaft seals are removed. Steering control systems appear satisfactory and rudder port appears satisfactory, components are disassembled. Propulsion components are disassembled. Generator surfaces and motor mounts appear good. Generator’s peripheral components and systems appear good. The port generator’s hour meter reads 31,289 and a tag indicates a rebuild at 20,656. The starboard generator’s hour meter reads 31,392 and a tag indicates a rebuild at 19,931. Waste system and components appear good. Generals’ service seawater systems appear good. There is 5,200 gallon capacity in four metal tanks located two aft and two forward of engine room. Fuel tank surfaces, where visible, appear good and the securing mechanism appears good. The fuel fill, vent, feed and return lines and components appear good. Fuel shut off valves are located at the manifolds in the engine room and appear good. The AC shore cord, inlet and connections appear good. The AC wiring and outlets appear good. The AC main feed are protected with circuit breakers. Battery arrangement appears good. Batteries are equipped with a disconnect switches. DC wiring appears good. Circuit protection for the AC and DC branch system appears good. Wire terminations and connections appear good. Wire organization and arrangement appears good. Vessel has eight portable fire extinguishers with inspection tag dates of 9/2014, and one with inspection tag date of 5/2015. Vessel has fixed fire suppression units including: Fireboy FE241 (bow thruster), Fireboy FE241 (lazarette) and Kidde Fenwall 487 series halon 1301 with 9/2014 tag date (engine room). The safety components include: numerous type I PFDs and two throwable PFDs; distress flares with current certification – Sept. 2017; two Avon six person life rafts with July 2015 certification; suitable first aid kit; two bow anchors with chain rode that appears good. Navigational and anchor lights appear satisfactory (not tested). Other safety equipment includes: high water alarm, emergency dowel plugs, emergency engine driven bilge pumps, 406 MHz EPIRB with battery date 1/2018. The vessel is a composite fiberglass, flybridge, pilothouse, cockpit motor yacht. The vessel was manufactured in Tacoma, WA. The vessel is equipped with two diesel engines and two diesel generators. The client was reportedly a partner in the vessel when it was new and has since bought out the other partners. The vessel was inspected while hauled. 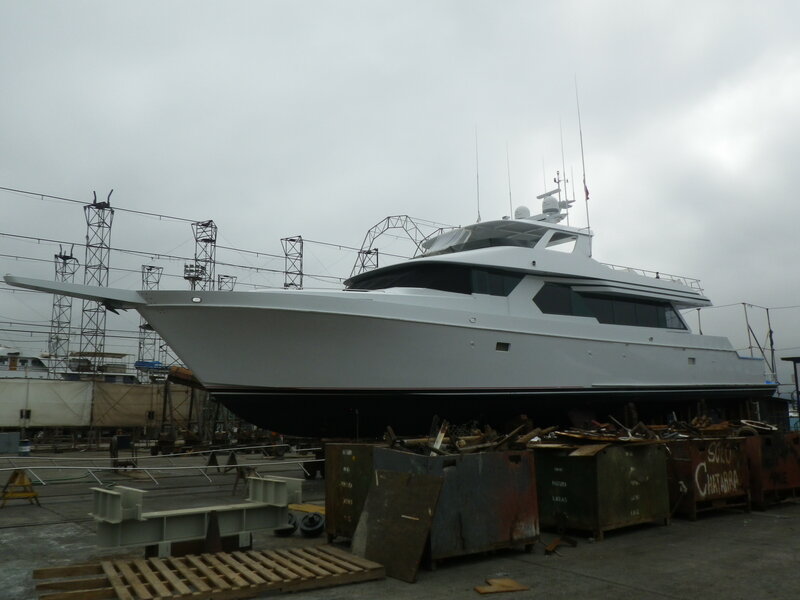 The captain reports that the hull was last painted in 2006 at Knight & Carver Yacht Center. The above deck components were painted at the dock over the next two years. The projects which had begun before our arrival include the removal of the propulsion components, rudders, several through hulls, fin stabilizers and bow rail. The engines were not test operated and no sea trial was performed. The vessel has a crew of three. The vessel is basically structurally sound. The vessel is suitable for its intended purpose as a coastal cruising vessel. This survey is for the express purpose of insurance and financing. It is not meant as a buyer’s survey. 1. There is a small crack across the top outboard on the starboard strut. Determine the significance and address appropriately. 2. The HIN is obscured on the transom with paint, modify so the HIN is legible per U.S. regulations. 3. Fluid has leaked from the stern capstans onto the engine exhaust hose blankets. As petroleum products can damage hoses not intended for exposure, access and inspect the exhaust hoses in these areas and eliminate any liabilities. 4. There is water below the starboard water tank, at the aft edge between the tank and the shelf upon which it is mounted. Determine the source and address appropriately. 5. There are salt crystals below the exhaust hose at a bulkhead penetration aft in the aft head. Eliminate the weep / leak. Remove crystalline deposits to allow detection of any future weep or leak. 6. While the vessel is hauled assure that all through hull valves are tested and proved properly functional. Two valves to port in the tank room (aft of the work room) were stiff and were not moved. 7. There are salt crystals on the top center forward portion of the aft fuel tank. Determine the source, eliminate the source and repair any damage. 8. There are salt crystals above and rust on a blower motor in the tank room to starboard, eliminate the source of the salt crystals and the rust stains and repair any damage. 9. There are salt crystals on bait systems components to starboard in the tank room, service to eliminate the source and remove salt crystals to allow detection of any future weeps and leaks and address any associated damage. 10. A connection on a battery terminal in the aft engine room bilge includes three battery cables and a nut which is not fully engaged on the stud. Modify to assure a proper and secure connection. 11. The trim about many of the windows has blistered paint and signs of leakage, address as necessary. 12. There are salt crystals in the locker at and above the port fin stabilizer, eliminate the source of the salt crystals, remove salt crystals to allow detection of any future weeps or leaks and address any damage. 13. There is salt residue visible to starboard below the pilothouse helm console. Eliminate the source, remove salt crystals to allow detection of any future weeps or leaks and address any damage, particularly any damage to electronic components. There is surface rust visible on electrical components including terminal boards in this area. 1. Two paddlewheels are missing from paddlewheel transducers on the hull bottom, one aft and one forward. Replace if / as necessary. 2. There is minor cosmetic damage externally including damage to the red boot stripe to port, a visible patch in the green boot stripe on the port side near the transom and several small dings on the starboard hull side. Address as desired. 3. Several port lower rub rail fasteners are missing to port and one to fastener to protruding to starboard. Address appropriately. 4. The door to the diesel fuel dispenser in the transom door’s threshold is seized. We did not access and inspect these components and they are reportedly no longer in use. Consider eliminating any liabilities including the corroded (red) pump in the starboard lazarette. 5. The stern capstans have been abandoned. The captain stated they are not used in the normal operation of the vessel. 6. We did not unplug the 100 amp shore power cord from the inlet, disconnect, inspect the shore inlet and cord connector and address any liabilities. 7. We did not pull up covers which were fastened down to protect the vessel including covers over the lockers forward in the cockpit, access, inspect and address any liabilities. 8. We did not test and prove the high water alarm, we recommend this test. 9. Address salt crystals on two valves for refrigeration compressors’ raw water systems, to starboard in the tank room. 10. There is soot to starboard forward in the tank room outboard and overhead, the captain reports this is likely from a smoke inducing electrical problem which happened many years ago. Clean the soot as possible to allow detection of any future smoke or soot inducing incidents. 11. The paint is blistering on the aluminum hardtop supports for the flybridge, address as desired. 12. There is various sideliner and headliner damage. They are loose and wrinkled in many areas of the interior of the vessel. Address as desired. 13. The pilothouse previously had mechanical controls connected to the control levers which are also electronic. The captain reports that there were problems with the control system and disconnecting the mechanical controls appears to have eliminated those problems. Their design was to provide redundancy, we strongly encourage returning that redundancy while eliminating the reported previous problems.